At least 23 persons, including nursing mothers and children have been reportedly killed and hundreds of others displaced from their abodes in the Ibori, Ugbalo, Ewu-Eguare, Idogalo and Oludide communities of Edo Central, Edo State by gully erosion. Recounting their ordeals on Friday, some of the community leaders viz. Daudu of Oludide Village; head of Ibori, Alhaji Gaz; Asene Iyere and Mallam Mutaro Ibramai of Ewu, said over eight people had so far been washed away by the gully erosion that has taken over the place. 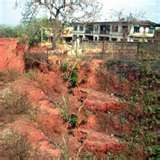 Reacting to the incident, Edo State Commissioner for Environment, Mr. Clem Agba, said the government was not oblivious of about 110 active gully erosion sites in the state. He said, “We have taken inventory of all of these sites. Oshiobugie gully site is the biggest we have in the state. It used to be seven fingers, but with a recent survey of the area, we discovered that new fingers are beginning to develop and that is why we decided to go and see where these fingers came from. We are doing a number of resettlement studies to settle all those who live around these areas.